I made this layout for Shimelle.com for National Scrapbooking Day! Challenge: Use any current paper line from the American Crafts family - that includes American Crafts, Crate Paper, Pebbles, and Studio Calico. Perfect challenge for me :) I chose to go with the Sundrifter line by Studio Calico. The pastel color palette paired with pops of brights and black/white matched perfectly with my Easter photoshoot pictures. 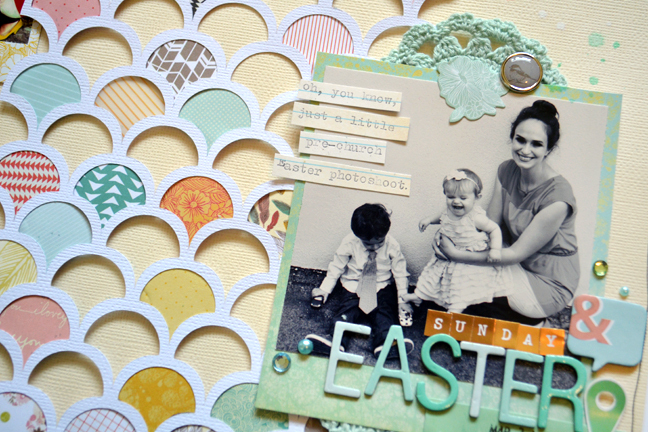 I've never scrapped about Easter before so I was really excited to make this layout! The scalloped background die cut looked like stacked Easter eggs and I thought it'd be fun to back the shapes with patterned papers for a unique focal element. Journaling says: Oh, you know, just a little pre-church Easter photoshoot. How to: Use a circle punch to trim away the corners of a cream cardstock background then go around the edges with a black pen, adding a few trios of "x"s here and there. Die cut a scalloped background from white cardstock and back most of the shapes with patterned paper as well as patterned vellum from the Sundrifter line by Studio Calico. The 6x6 patterned paper pad is great for cutting tiny shapes because the patterns are smaller. 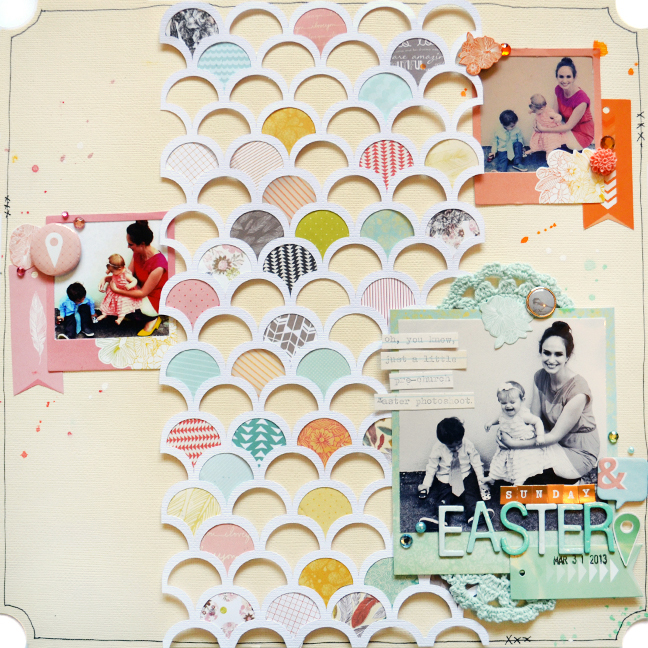 Add photos behind Polaroid die cuts and adhere them on the layout. Embellish around each photo with matching colored elements like jewels, pearls, crocheted doily trimmed in half, acrylic flower, additional die cuts, a brad, a badge, and more as shown. Drop matching colored spray mist around each photo cluster. Create a title on the largest photo using Thickers and gold mini alphabet stickers. Stamp the date below the title on a pennant tag. Type journaling on a typewriter, cut it into strips, and glue them on the empty space of the photo. Happy National Scrapbooking Day! Lots more stuff to share today! I just saw this over there!! It is beautiful!!!! I love how you used paper to add dimension. Beautiful! I saw this yesterday at Shimelle's and actually pinned it a few minutes ago before I realized coming here that it was yours. Gorgeous!!! BEAUTIFULLY done I really like how you highlighted this cut! Loving every detail of this beautiful layout!